There are very few positive holiday memories that I have. I outlined a few not so positive ones here, and I glossed over Thanksgiving. It really wasn’t a big holiday growing up, but there are two things on the table that I really liked. 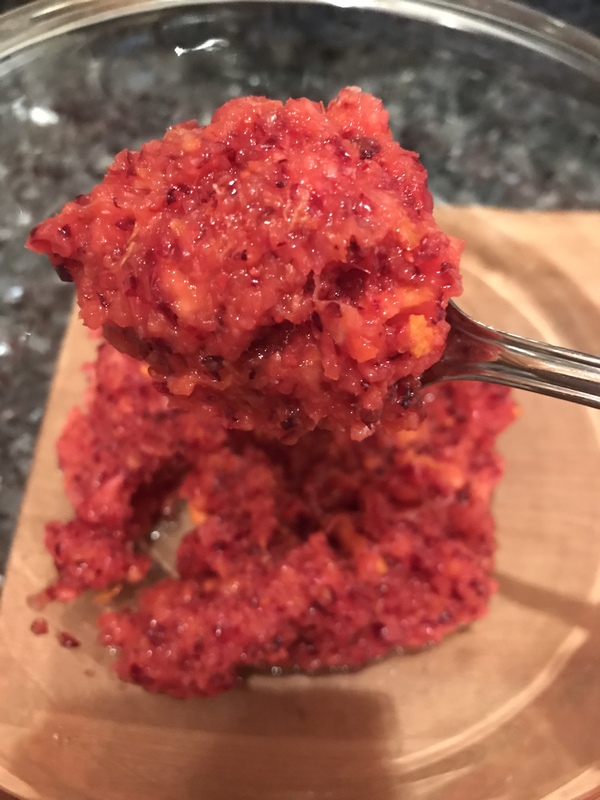 Cranberry relish: as you imagine, similar to the pickled kind, it’s coarse and used on stuff – not usually eaten on it’s own. Dissimilar to the pickled kind, it’s sweet, slightly tart and not tangy or sour or salty for that matter. Since I never play by the rules, it’s my favorite on it’s own. As a kid we live in bubbles, which can be a problem as we enter into adulthood. It never occurred to me that other families never had these two dishes on their table. After many years of not having them, I introduced JP to cranberry relish last year. He still favors the canned jellied kind and that’s completely okay, but last year we had both kinds on the table. There’s also a slight chance that we made cocktails with the relish as well, and we’ll get to that too because I’m sure you’re making a few faces right now. 1. 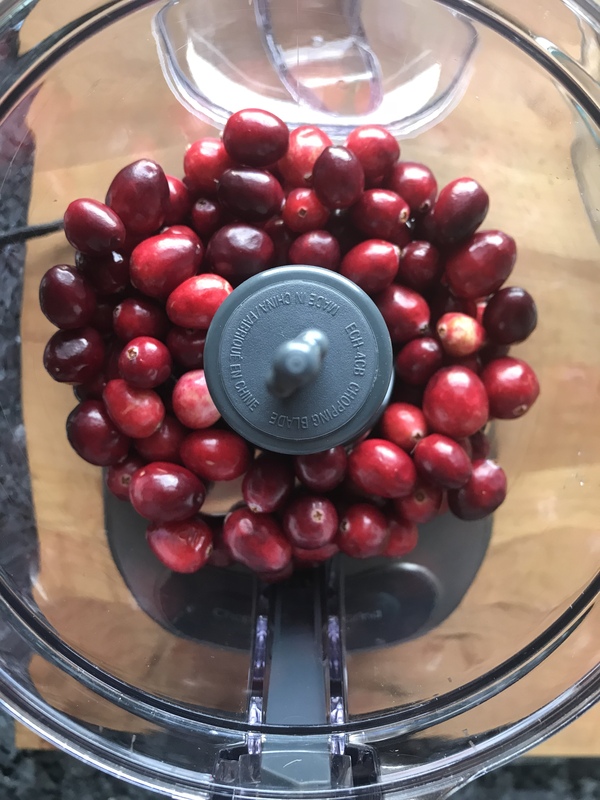 In a food processor, chop 1 cup of cranberries until coarse. 2. Wash an unpeeled orange and then remove the ends by cutting them off. You’ll be adding the rind to the mixture and the stem end is hard and bitter. 3. 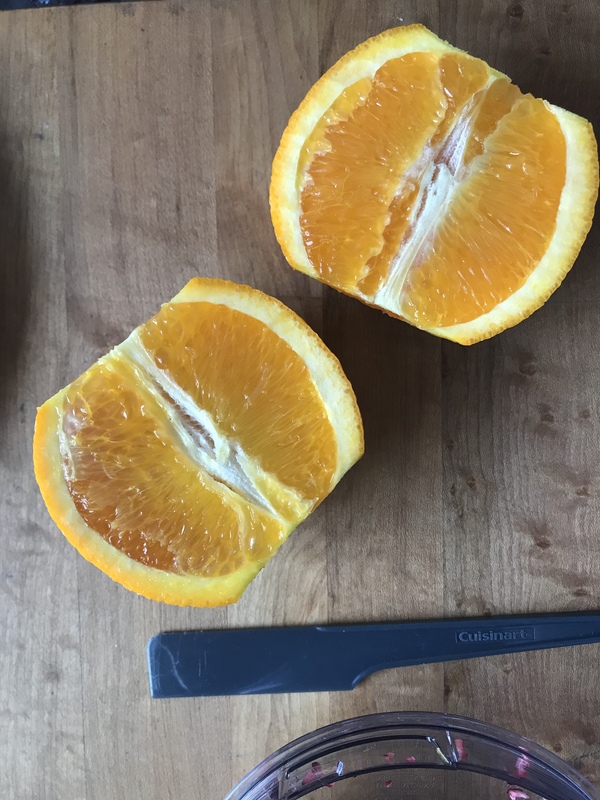 Cut the orange in half. 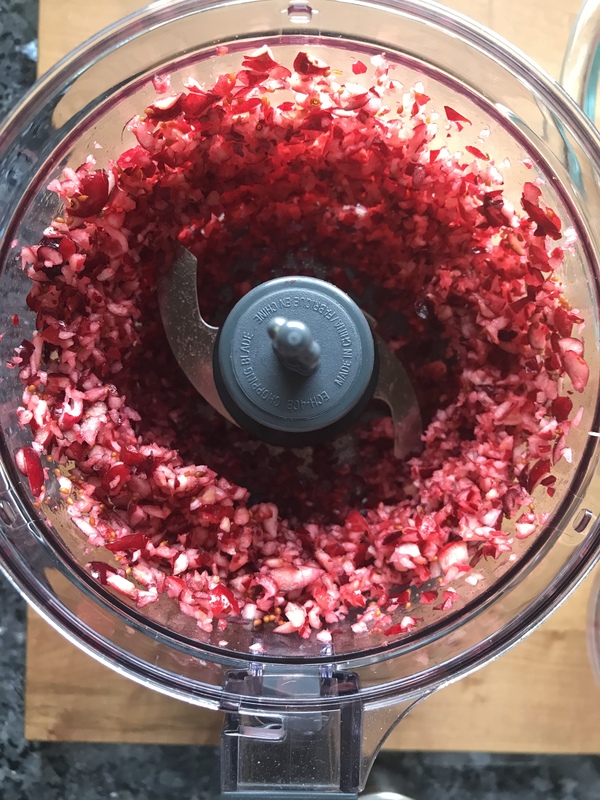 Then slice one half and add to the food processor. Eat the other half. 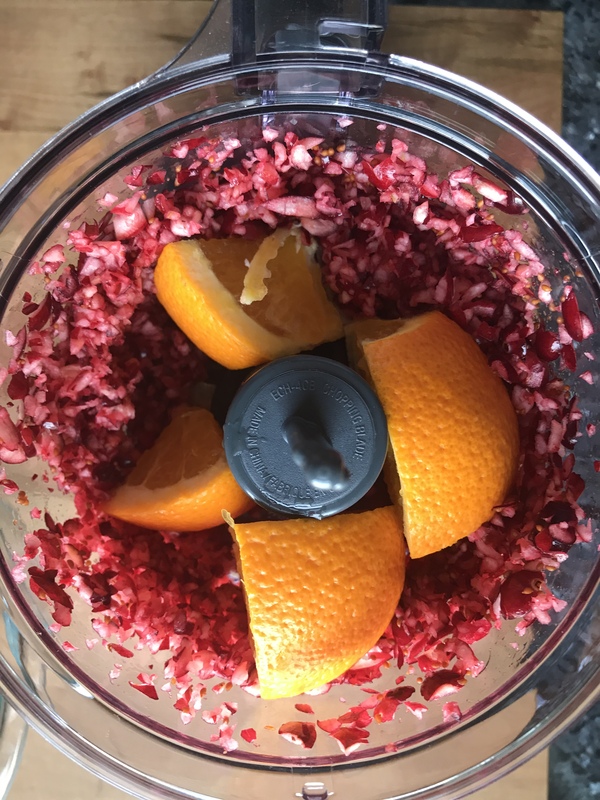 Before continuing to grind, you may need to mix the chopped cranberry up a bit to allow the blades to move effectively through the orange. 4. 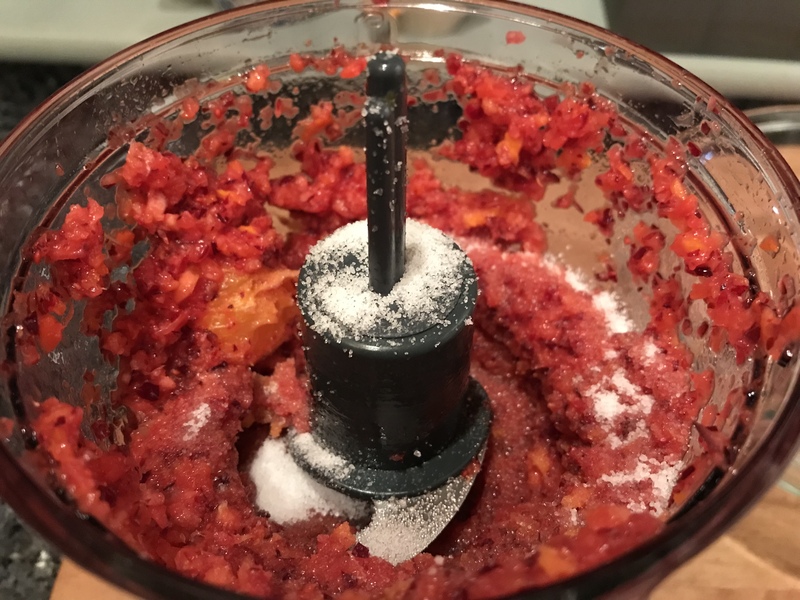 Once the orange is chopped and mixed in, pulse a teaspoon of sweetener to cut the tartness of the cranberry. I’ve used Splenda in the past and using Truvia works fine as well. You could also use white sugar, but may need to adjust sweetness to preference. Growing up, this was used on the Thanksgiving turkey just like you would jellied cranberry sauce. 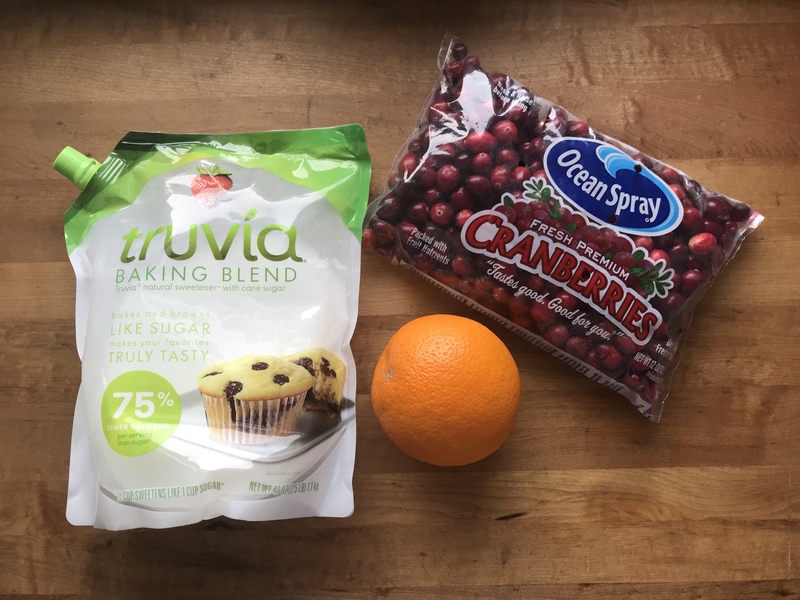 Now, I’ve had jellied cranberry sauce, but I like this because of the orange and the texture – I like foods with texture. Aside from on its own, this is great on left turkey sandwiches. It’s also good with yogurt and cottage cheese – probably two things that it was never really intended for. Last year, JP and I discovered it was great with vodka and this year we’re trying gin. To make a cocktail: 1/3 cup of cranberry relish + 1/2 cup of clear distilled liquor like vodka or gin. Combine in a jar and refrigerate overnight. Strain relish/pulp from liquor. Combine 2 ounces of liquor with 6 ounces of chilled seltzer or Sprite. What twists do you have at your table that you never realized that others didn’t have at theirs?